Hello, and welcome to the SABL, or Société d'aménagement de la baie Lavallière. We have an exceptional reception centre, the Maison du Marais, where we offer interpretive activities. Our purpose is to educate people about conservation, and especially about protecting wetland environments, since we're right in front of Baie de Lavallière, a marsh that covers 21 square kilometres. The Maison du Marais has been our headquarters since the early 2000s. Over the years, we have developed various infrastructure for visitors, with a focus on ecotourism. We offer kayak and canoe rentals to encourage people to explore Baie de Lavallière and the Sorel islands. The Société d'aménagement de la baie Lavallière has three main areas of activity. First, we educate people about conservation. We also conduct wildlife research. Lastly, we run the Chenal-du-Moine campsite, where visitors can stay. All of our activities are focused on conservation. We try to incorporate educational messages into all of our activities. The Société d'aménagement de la baie Lavallière was created in 1989 by a group of hunters, fishermen and wildlife enthusiasts. They decided to create an association to protect and manage Baie de Lavallière. Since then, we have participated in management and research projects in Baie de Lavallière, as well as in the Sorel islands, as you'll see later; we'll take a look at our duck banding project. Here we are in Baie de Lavallière. It's a managed marsh. They say it's the largest managed marsh in eastern North America. It's one of the last bastions, as it were, of the natural habitats typical to the region, apart from the Sorel islands. That's why there are so many birds: 300 species of birds, with 180 species nesting here. These birds are attracted by the diverse habitats we have here. There are swamps where large trees grow, mainly silver maples, but also red ash and black willows. We also have marshes, aquatic plant communities, deep marshes, shallow marshes; these habitats attract various species of birds. That's why there are so many kinds. Different birds can be seen here in each season. Spring is the best season for observing waterfowl. A little later, the breeding birds arrive: sparrows, gallinules, rails and many more. In the fall, starting in August, there are a lot of shorebirds, small waders that can be seen on the beaches. A little later in the fall, large numbers of raptors, or birds of prey, pass through here. Why do they come here? There are updrafts that enable them to gain altitude for their migrations. They can also feed here, because there are many birds and mammals in these habitats that are attractive prey for raptors. I would say this is the best place in Quebec for birdwatching. We are continually finding new species, because some species that don't live in the region are blown here by winds and storms, and other species are expanding their territories, like the Turkey Vulture and the Great Egret, which now breeds in large numbers in the Lake Saint-Pierre region. This is a great place for birdwatchers. (At the banding station) I make little doors so that ducks can get inside the enclosure. Once the ducks get in, they can't find their way back out. When I come up in my boat, they try to fly away, but there's a net overhead. They don't try to find their way back out; instead, they try to escape to the rear of the enclosure, where there's a cage. So I push the birds in that direction. Then I close the tunnel and push them up into the cage. That's when we start the banding process. We install the net, to give the ducks a chance to get used to the net and the platform, because they're afraid. These are wild ducks. We started this process last week. 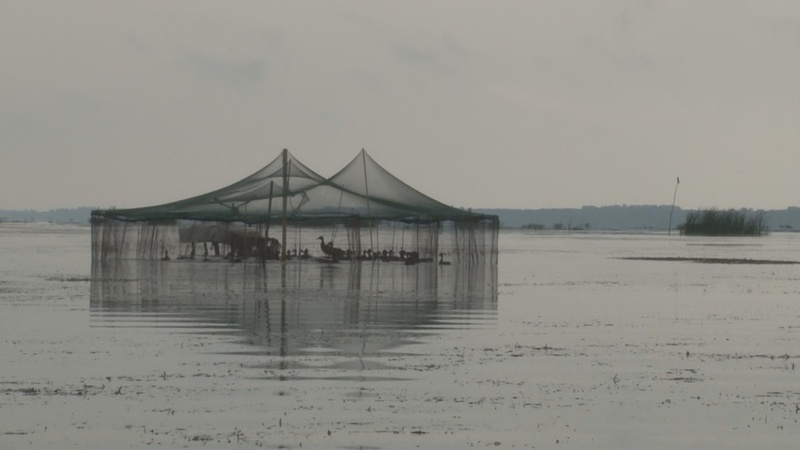 For the ducks to become habituated, and for the netting to be placed over the top, it takes two weeks. After two weeks, we close the net. The ducks come in, and we start banding them. Number 16, a young female. This is cage number 4. (Caroline Courchesne) Yes. (Paul Messier) The band must be perfectly round and the gap must be closed. Sometimes we find ducks whose bands weren't closed properly. They get stuck on small branches. They're exposed to predators, and they get caught. Ducks always take off into the wind. It helps them gain altitude, like a plane; they don't like to take off against the wind. When you can see some red here, and the cloaca doesn't open completely, it means that the duck is still a juvenile. These are all indications that the duck is a juvenile, hatched this year. Why do we do this? We want to monitor duck population growth. If one species becomes more abundant, we adjust hunting quotas accordingly. For example, one year we allowed hunters to take eight Mallards and take fewer Black Ducks. That's what banding stations are for. Because we noticed that Mallards were increasing, and Black Ducks were declining. So we changed the quotas; now you can take eight Mallards and two Black Ducks. It changes from year to year. Over the past 30 years, the Mallard has taken over from the Black Duck. Look. I've taken out two ducks to show you the difference. I've got a Mallard in my left hand and a Black Duck in my right hand. This is a young female. I can tell at a glance. I've been doing this for a while. (Caroline Courchesne) Yes. (Paul Messier) You can see the difference. This one is much darker. Also, if you look at the wings, the speculum here is not the same. Look at the colour; they are different shades of blue. The two white stripes bordering it are absent, and the wing is greyer. This is a young male Mallard, and this is a young female Black Duck. The banding station on Lake Saint-Pierre has also been used as a training station for many years. We have interns, like you, who come here to learn how to band waterfowl. And also, every bander in Quebec has spent time banding waterfowl on Lake Saint-Pierre, because they all learned how to do it here. This is one of the oldest stations. Ducks were first banded on Lake Saint-Pierre in 1938. So it dates back a while. Over the years, sometimes there have been more people working at the station, sometimes fewer. The station has been operational again since 1988. The SABL is in charge of the banding station on Lake Saint-Pierre. We band about 3,000 ducks each year. (Caroline Courchesne) We've almost reached that number. (Paul Messier) Yes, and it's mostly Mallards.